* This Art Deco Hair Comb by Mariell is 3" w x 2" h will add a unique vintage look to any Bridal, Prom or Bridesmaids hair style. * Our Silver Rhodium hair comb with inlaid Crystals looks great worn on its own or it can be paired with another one for a bolder statement. * This gorgeous Art Deco Hair Comb is a popular hair accessory for weddings, proms, homecoming or bridesmaids at an attractive low wholesale price. 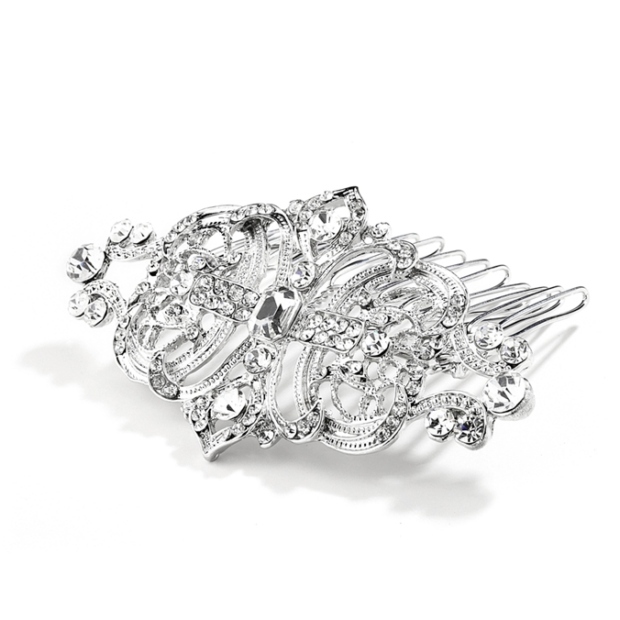 * With inlaid crystals and vintage rhodium plating, this medium sized comb is great for any occasion!